Ukrainian heavy-lift orbital launch vehicle. The R-56 was Yangel's ultimate superbooster design. Trade studies begun in 1962 resulted in a conventional tandem stage design capable of being transported on the Soviet canal system from the factory to the launch site, while still placing 40 metric tons into low earth orbit. However various Soviet government factions favored the much larger (and less practical) Korolev N1 or Chelomei UR-700 designs. Yangel made one last attempt to convince the government to sponsor a common approach to the lunar program, with different design bureaus concentrating on just one part of the mission, as the American's were doing. But his practical solutions obtained no traction, and further work on the R-56 was abandoned. AKA: 8K68. Status: Study 1962. Payload: 40,000 kg (88,000 lb). Thrust: 23,220.00 kN (5,220,060 lbf). Gross mass: 1,421,000 kg (3,132,000 lb). Height: 67.80 m (222.40 ft). Diameter: 6.50 m (21.30 ft). Apogee: 200 km (120 mi). 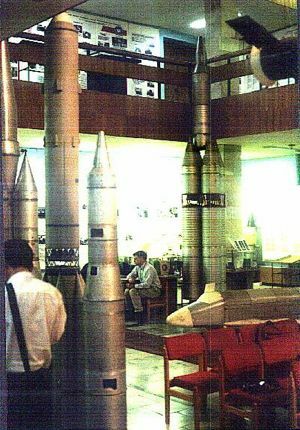 After drawing back from the 'cluster of R-16's' approach of the SK-100, Yangel conducted some trade studies to determine the optimum design for his bureau's first �super rocket'. The booster was to be capable of serving as a first-strike military global rocket or as a heavy launch vehicle, placing 40 metric ton payloads into a 200 km polar orbit. The selected monoblock design could be transported on the Soviet internal canal system from the factory to the launch site. The R-56 would have been 67.8 m long and consisted of three stages, the first two with a basic diameter of 6.5 m. The first stage had a flared 8.2 m diameter base to accommodate the 16 RD-253 engines. Larger diameter core better suited to carrying low-density liquid hydrogen / nuclear thermal engine upper stages for manned interplanetary spacecraft. The selected monoblock vehicle was 67.8 m long and consisted of three stages, the first two with a basic diameter of 6.5 m. The first stage had a flared 8.2 m diameter base to accommodate the 16 engines. 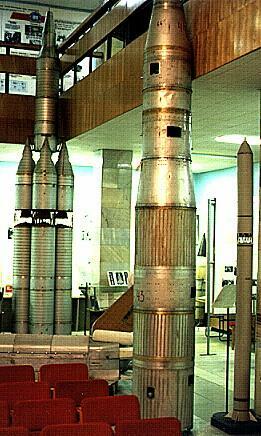 These were developed by Glushko's OKB-456, and each produced 148 metric tons of thrust at lift-off. The thrust and technical characteristics indicate they would have been identical to or closely derived from the RD-253 engine developed for Chelomei's UR-500 rocket. Twelve of the main engines were fixed while four were gimbaled in pitch to provide launch vehicle steering. Separate propellant tanks were arranged with the oxidizer forward tank forward, the fuel tank aft. 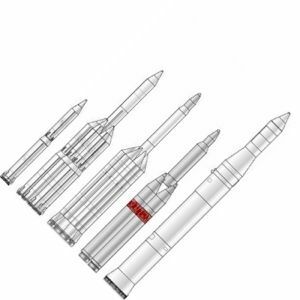 It is said that the launch vehicle was equipped with a recovery system; this probably applied only to the first stage, which the figures indicate has an unusually high empty mass, perhaps including a means of recovering the stage or engine section for reuse. The second stage had a common bulkhead between the oxidizer and propellant tanks. It was equipped with a single fixed main engine of 172 metric tons thrust. The technical characteristics indicate that it was identical with the RD-254 high-expansion ration derivative of the RD-253 also developed for Chelomei's UR-700. Four vernier engines, with a total thrust of 50,000 kgf, provided ullage force for main engine ignition, steering during main engine burn, and precise velocity correction after main engine cut-off. There were two versions of the third stage: a single start variant for placement of large payloads into low earth orbit, and a multiple start version for taking smaller payloads to high earth orbit or earth escape trajectories. It was equipped with a main engine of 50,000 kgf and four vernier engines totaling 5,500 kgf. The characteristics indicate it was probably based on Kosberg's RD-0213 engine developed for the third stage of the UR-500K Proton launch vehicle. The stage, while having nearly the same diameter as the Proton third stage, differed in design, with a common bulkhead between the oxidizer and propellant tanks. A fourth stage was designed to allow insertion of payloads into geosynchronous or lunar orbit. 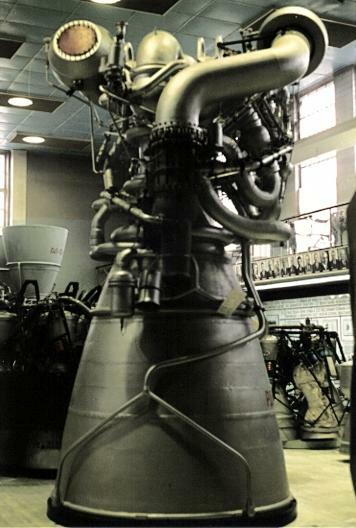 The propellants used and engine characteristics are identical to those of the experimental RD-280 engine developed by Glushko in the mid-1960's. The stage uniquely used the Aerozine-50 fuel developed in the United States for the Titan 2 ICBM. The engine was capable of four restarts. The assembled vehicle would be moved by road from the Yangel factory in Dnepropetrovsk to the mouth of the Surya River. From there it could be moved on the Soviet Union's elaborate inland waterway system to any of the existing launch sites - Kapustin Yar on the Volga, Baikonur on the Syr Darya, or Plesetsk on the Yemtsa. Kapustin Yar, the closest to the factory, was the preferred location. At the launch site the vehicle would be moved to an austere launch pad a short distance form the river. After being put upright it would be enclosed by a service tower providing an environmentally protected environment for final rocket and payload preparation. Growth versions of the R-56 would return to the cluster principle in order to boost larger payloads, such as those required for manned lunar expeditions. The 685,000 kgf RD-270 engine was also to have been used in later versions of the R-56. This would have reduced the number of engines in the first stage from 16 to 4. Yangel's KB Yuzhnoye was the prime contractor for the launch vehicle, with support from the Soviet Academy of Sciences, NII-88, NITI-40, GSPI, and the Ministry of Defense. By 1965 Yangel had decided that the bitter fight between Chelomei and Korolev over control of manned programs was damaging the Soviet space effort. In any case he could see that the size of the projects had reached such a scale that it was impossible for one design bureau to handle all of the required elements. He proposed a collaborative effort: Yangel would design and build the launch vehicle; Korolev the manned spacecraft; and Chelomei the unmanned spacecraft. As a practical matter it was not possible for one bureau to handle the moon landing project. Although Glushko and Chelomei refused to co-operate with Korolev on the effort, most other rocket design bureaus were involved. Yangel found himself charged with development of the LK lunar lander that would actually land a cosmonaut on the moon. Many thanks to Asif Siddiqi and Marcus Lindroos for providing source materials for this article. LEO Payload: 40,000 kg (88,000 lb) to a 200 km orbit at 90.00 degrees. Payload: 6,000 kg (13,200 lb) to a GEO. Stage 1. 1 x R-56 Block A. Gross Mass: 1,162,000 kg (2,561,000 lb). Empty Mass: 162,000 kg (357,000 lb). Thrust (vac): 1,608.000 kN (361,492 lbf). Isp: 316 sec. Burn time: 120 sec. Isp(sl): 285 sec. Diameter: 6.50 m (21.30 ft). Span: 8.20 m (26.90 ft). Length: 36.00 m (118.00 ft). Propellants: N2O4/UDMH. No Engines: 16. Engine: RD-253-11D48. Status: Study 1965. Stage 2. 1 x R-56 Block B. Gross Mass: 213,000 kg (469,000 lb). Empty Mass: 13,000 kg (28,000 lb). Thrust (vac): 1,980.000 kN (445,120 lbf). Isp: 325 sec. Burn time: 370 sec. Diameter: 6.50 m (21.30 ft). Span: 6.50 m (21.30 ft). Length: 12.00 m (39.00 ft). Propellants: N2O4/UDMH. No Engines: 1. Engine: RD-254. Status: Study 1965. Stage 3. 1 x R-56 Block O. Gross Mass: 32,000 kg (70,000 lb). Empty Mass: 2,000 kg (4,400 lb). Thrust (vac): 544.200 kN (122,341 lbf). Isp: 327 sec. Burn time: 190 sec. Diameter: 4.00 m (13.10 ft). Span: 4.00 m (13.10 ft). Length: 7.00 m (22.90 ft). Propellants: N2O4/UDMH. No Engines: 1. Engine: RD-0213. Other designations: Orbital Block. Status: Study 1965. Comments: Empty mass estimated (rounded figures given in source material indicates impossible 31 metric tons gross with 30 metric tons propellant). Stage 4. 1 x R-56 Block K. Gross Mass: 9,400 kg (20,700 lb). Empty Mass: 700 kg (1,540 lb). Thrust (vac): 117.000 kN (26,302 lbf). Isp: 350 sec. Burn time: 350 sec. Diameter: 4.00 m (13.10 ft). Span: 4.00 m (13.10 ft). Length: 5.00 m (16.40 ft). Propellants: N2O4/Aerozine-50. No Engines: 1. Engine: RD-280. Other designations: Space Block. Status: Study 1965. Comments: Empty mass estimated (rounded figures given in source material indicates impossible 9 metric tons gross with 8.7 metric tons propellant). R-56 Polyblock Ukrainian heavy-lift orbital launch vehicle. One design approach considered for Yangel's R-56 superbooster of the 1960's was a polyblock design limited to rail transport restrictions (4 x 3.8 m diameter stages clustered together). Although a dynamic test model was built and tested at TsNIIMash, Yangel finally reached the conclusion that a monoblock design was clearly superior to polyblock versions. Further work on the polyblock design was abandoned. TsNIIMash exhibits in its small museum the 1:10 structural simulation model of the 3.8 m diameter polyblock design. R-56 Polyblock ICBM Ukrainian intercontinental ballistic missile. TsNIIMash has 1:10 structural simulation model. Three stage carrier rocket with consecutive first and parallel second stages. Range indicated on placard; possibly considered as monster ICBM in competition with UR-500. Work began in 1961. Family: heavy-lift, orbital launch vehicle. Country: Ukraine. Engines: R-56 Blok A, R-56 Blok B. Stages: R-56 Block K, R-56 Block O, R-56 Block B, R-56 Block A. Agency: Yuzhnoye. Bibliography: 193, 417, 430. RD-270 Rocket Engine - largest single-chamber engine ever developed in the Soviet Union.